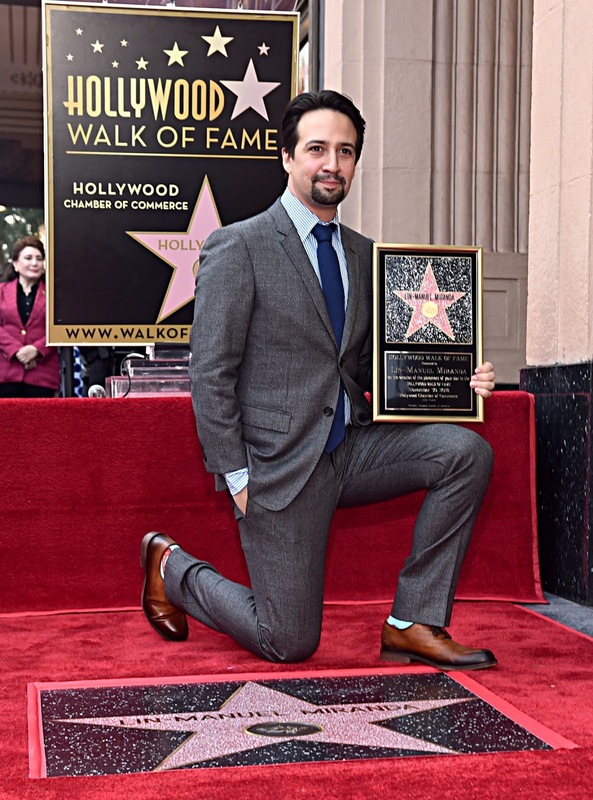 Lin-Manuel Miranda received a star on the Hollywood Walk of Fame on November 30. 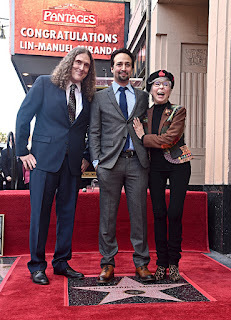 Guest speakers “Weird Al” Yankovic and Rita Moreno were on hand at the event. Miranda’s star, the 2,652nd star on the Hollywood Walk of Fame, can be found at 6243 Hollywood Boulevard in front of the historic Pantages Theatre. Lin-Manuel Miranda was born and raised in Inwood/Washington Heights in New York. He is an award-winning composer, lyricist, and performer, as well as a 2015 MacArthur Foundation Award recipient. His current musical, Hamilton - with book, music and lyrics by Miranda, in addition to him originating the title role - opened on Broadway in 2015. 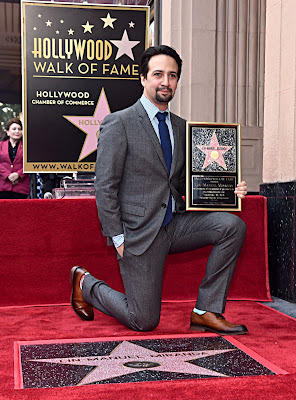 Hamilton was awarded the 2016 Pulitzer Prize in Drama and earned a record-breaking 16 Tony Nominations, winning 11 Tony Awards including two personally for Miranda for Book and Score of a Musical. The Original Broadway Cast Recording of Hamilton won the 2016 Grammy for Best Musical Theater Album. Both Miranda andHamilton won the 2016 Drama League Awards for Distinguished Performance and Outstanding Production of a Musical, respectively. For its sold-out Off-Broadway run at The Public Theater, Hamilton received a record-breaking ten Lortel Awards, as well as three Outer Critic Circle Awards, eight Drama Desk Awards, the New York Drama Critics Circle Award for Best New Musical, and an OBIE for Best New American Play. Material from the show was previewed at the White House during its first-ever Evening of Poetry & Spoken Word in 2009, Lincoln Center Theater’s 2012 American Songbook Series, and New York Stage and Film’s 2013 Powerhouse Theatre Season at Vassar College. The Chicago production of Hamiltonopened in October 2016, with a 1st National Tour and London production both opening in 2017. The London Production went on to win seven Oliver Awards in 2018, including Best New Musical and Outstanding Achievement in Music for Miranda and orchestrator Alex Lacamoire. The Hamilton Mixtape, a concept album inspired by the show’s score featuring top rappers and musicians in the music industry, was released in December 2016. Lin-Manuel received a 2017 MTV VMA Award in the “Best Fight Against the System” category for the video, “Immigrants (We Get the Job Done)” off of The Hamilton Mixtape. 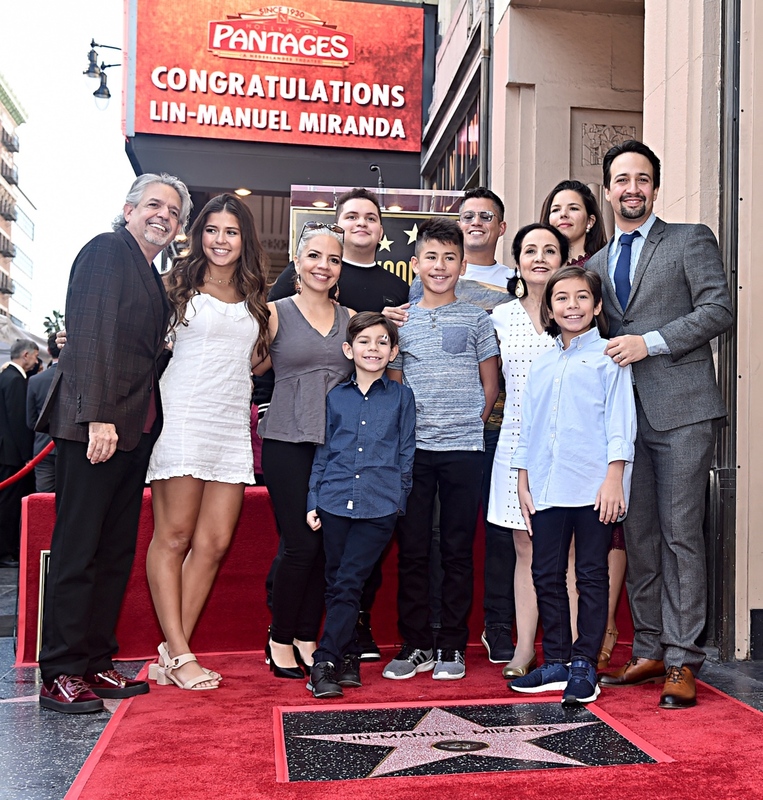 In January 2019, Lin-Manuel will return to the role of Alexander Hamilton when the Hamilton tour visits Puerto Rico for an unprecedented three-week engagement. Proceeds from these performances benefit the Flamboyan Arts Fund, an initiative dedicated to preserving, amplifying, and sustaining the arts in Puerto Rico. 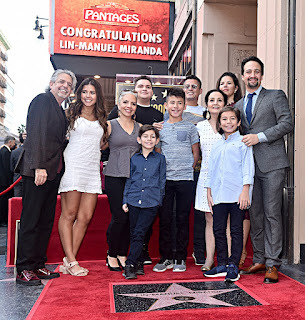 Miranda’s first Broadway musical, In the Heights, received four 2008 Tony Awards (including Best Orchestrations, Best Choreography and Best Musical), with Miranda receiving a Tony Award for Best Score, as well as a nomination for Best Leading Actor in a Musical. In the Heights also took home a 2009 Grammy Award for its Original Broadway Cast Album and was recognized as a Finalist for the 2009 Pulitzer Prize in Drama. In 2016, Miranda won the Olivier Award for Outstanding Achievement in Music for the Original London production of In the Heights. Off-Broadway, In the Heights received a Drama Desk award for Outstanding Ensemble Performance, the Lucille Lortel Award and Outer Critic's Circle Award for Best Musical and Miranda received an Obie Award for Outstanding Music and Lyrics. Miranda has lent his voice to the audiobook recordings of The Brief Wondrous Life of Oscar Wao by Junot Diaz and Aristotle and Dante Discover the Secrets of the Universe by Benjamin Alire Saen. His TV and Film credits include: The Electric Company, Sesame Street, The Sopranos, House, Modern Family, Polar Bears, Do No Harm, Smash, How I Met Your Mother, Inside Amy Schumer, Difficult People, Hamilton’s America, Saturday Night Live (2017 Emmy nomination. Guest Actor), Drunk History, DuckTales, BoJack Horseman, Curb Your Enthusiasm, The Odd Life of Timothy Green, 200 Cartas, Speech and Debate and Moana. Miranda has actively supported the relief efforts in Puerto Rico following Hurricane Maria in September 2017, creating the benefit single, “Almost Like Praying” as well as releasing its Salsa Remix, benefitting the Hispanic Federation's UNIDOS Fund, helping relief and recovery efforts on the island. Miranda and Jennifer Lopez released the charity single, “Love Make The World Go Round” as a tribute to the victims of the 2016 Orlando nightclub shooting. He has continued to respond to tragedy with music, teaming with composers Benj Pasek & Justin Paul and Tony Winner Ben Platt for "Found/Tonight" supporting the March For Our Lives Initiative. Miranda co-stars with Emily Blunt in Disney’s “Mary Poppins Returns,” an all new original musical and sequel. 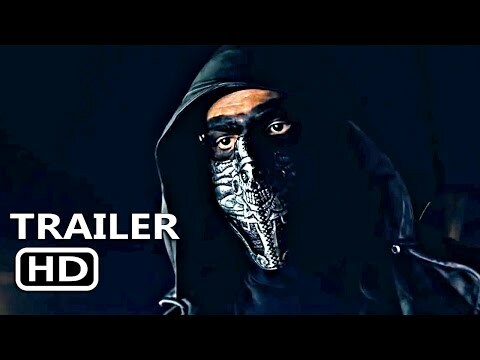 The film opens nationwide on December 19.